CNN, rival networks, and the White House Correspondents Association all spoke out against the administration's action. On Wednesday afternoon Collins was representing all the television networks as the "pool reporter" in the room during a meeting between Trump and Jean-Claude Juncker, the president of the European Commission. A few minutes later, Collins was asked to come to Bill Shine's office. Shine, a former co-president of Fox News, is the new deputy chief of staff for communications. Shine and press secretary Sarah Sanders met Collins there. "They said 'You are dis-invited from the press availability in the Rose Garden today,'" Collins said in an interview. "They said that the questions I asked were inappropriate for that venue. And they said I was shouting." Collins said she reacted by saying, "You're banning me from an event because you didn't like the questions I asked." Collins said Shine and Sanders asserted that "we're not banning your network. Your photographers can still come. Your producers can still come. But you are not invited to the Rose Garden today." In a statement in response to press inquiries, Sanders confirmed the dis-invitation. She claimed Collins "shouted questions and refused to leave despite repeatedly being asked to do so." In a statement, CNN disputed the White House's assertion that Collins' questions were inappropriate. 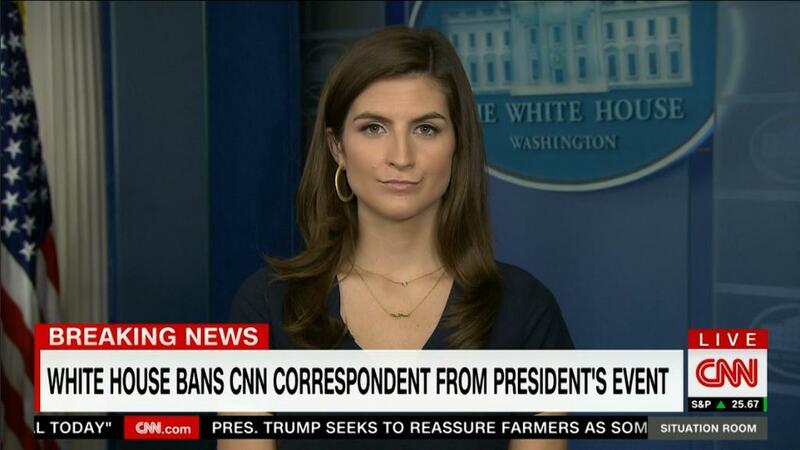 "Just because the White House is uncomfortable with a question regarding the news of day doesn't mean the question isn't relevant and shouldn't be asked," the network said. "This decision to bar a member of the press is retaliatory in nature and not indicative of an open and free press. We demand better." What Collins described -- telling a well-known and well-respected reporter that she can't attend a presidential event -- is another serious escalation against the press by the Trump administration. "This type of retaliation is wholly inappropriate, wrong-headed, and weak. It cannot stand," the group said in a statement. Fox News, one of CNN's top competitors, also spoke out. "We stand in strong solidarity with CNN for the right to full access for our journalists as part of a free and unfettered press," Fox News president Jay Wallace said. Wallace and Shine previously worked together for many years. Reporters from the major networks take turns as the TV "pool reporter." Wednesday happened to be CNN's day. On some days, there's only one opportunity to ask the president questions. So Collins felt she should ask about two of Wednesday's biggest stories when journalists were let inside the Oval Office for a portion of Trump and Juncker's meeting. She asked: "Did Michael Cohen betray you, Mr. President?" She repeated the question, then asked "Mr. President, are you worried about what Michael Cohen is about to say to the prosecutors? Are you worried about what is on the other tapes, Mr. President?" This was a follow-up to Trump's Wednesday morning tweet about the Cohen tape that CNN aired on Tuesday night. Trump didn't answer, so Collins changed subjects. She asked, "Why is Vladimir Putin not accepting your invitation, Mr. President?" This was a reference to last week's announcement by Sanders that Putin was being invited to Washington in the fall. Trump rebuffed the questions by saying, "thank you very much, everybody" to the press pool. Collins said the photo op was "totally normal." "It wasn't anything different from any other pool spray," she said. She was taken aback by Shine and Sanders' assertions later in the day. Recalling what she told them in the short meeting, she said, "I'm from Alabama. I'm not rude. I believe you should always be polite when you ask a question. I totally believe that."